From the first time I went to a movie at the movie theatre (E.T. was the earliest I can remember), I felt an instant connection to the artistry of film. I am quite thankful that the 80's offered so many classics, filled with memorable characters and highly imaginative stories. For me, these beloved films are like Doc's Delorean (hence the header license plate nod). They instantly take me back to an age that formed the foundation of my creative journey, my fondness for film ... and a whole slew of awkward middle school moments. I am deeply grateful for the invitation to create a piece for Pixartimes, and honored to be among so many admired creatives. I was inspired to combine my favorite childhood films and my love for all things Pixar, and what better way to do that then the timeless art of the movie poster! 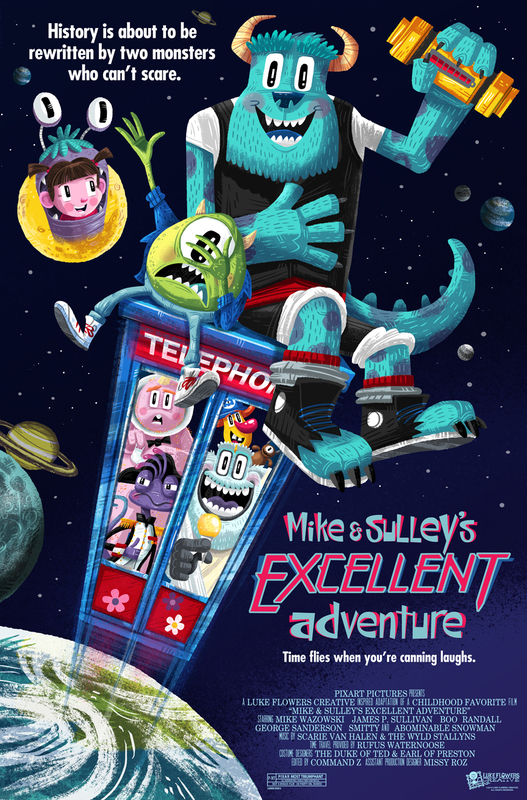 Each poster is based off the original movie poster from my favorite 80's film then given a Pixar twist. The credit text on the posters have quirky nods to both the Pixar film and original film stars, directors, composers, etc. … see if you can make the connections! My goal is to complete a poster for each Pixar film and a favorite 80's film. I've got a long way to go, but I hope to dive back into this project Summer 2017, so be sure to check back soon. Check out pixartimes.com for the Q & A and original Jan. & Feb. posts! I had an incredibly fun time with this poster mash up. One because Raising Arizona is my all time favorite comedy. There are so many classic characters, lines and ridiculous storytelling elements. Add to that the fact that Finding Nemo is a close favorite to my heart because of the father & son story, and the incredible nautical world Pixar created around them. Full on flood of inspiration for creation! May: It's camping season, so what better way to celebrate the great outdoors than with my favorite forest friend adventure. Harry and the Hendersons & the wild wooly characters of Brave! This may not have been a bigfoot sized blockbuster, but it was a family favorite of ours. Big hairy giants ... my mom had 4 of them on her hands. 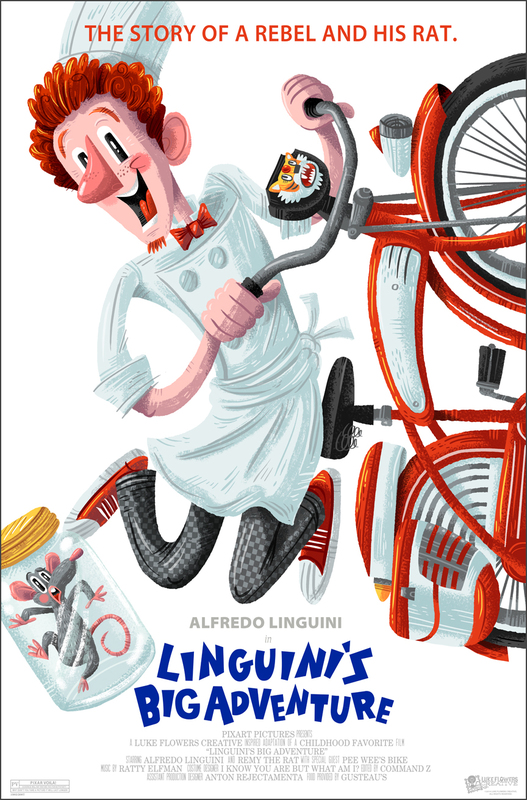 Plus, Mr. Henderson is an illustrator, which I always loved! Note: The planets in this poster always confused me, there are 3 earths, 3 moons and 2 Saturn's. Someone got lazy with the cut and paste. FEBRUARY: Inspired by one of the most iconic images from my childhood, Daniel doing the crane on the cliche' 80's California beach. This poster worked perfectly with Karl and Russel as Daniel and Mr. Miyagi, and of course Kevin was made to do the crane. I decided to loose the gulls because it would have been to distracting for Dug. GULL! Note: In the original movie poster, Pee-Wee's bike does not have all the accessories that it does in the film. I have corrected that for my pixarposter, and the studio eventually did on the DVD release. UP NEXT: JUNE - Finding Nemo meets Raising Arizona! !